Qatari authorities welcomed Thursday Saudi Arabia’s decision to facilitate the Hajj for Qatari nationals after Riyadh opened the frontier and announced sending of jets to Doha international airport to fly out Qatari pilgrims at the Saudi monarch’s expenses. Qatari foreign minister Sheikh Mohammed bin Abdulrahman Al Thani welcomed the decision but also indicated that Doha is expecting Saudi Arabia to lift all other restrictions unlawfully imposed on Qatar. 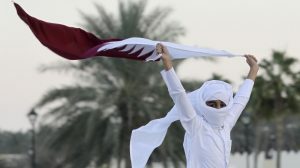 “Regardless of the manner in which Qataris were banned from the pilgrimage, which was politicized, and the manner in which they were again permitted to make the pilgrimage, which was also politicized … the government of Qatar welcomes the decision and will respond positively,” the foreign minister said at a press conference with his Swedish counterpart in Stockholm. Saudi Arabia state news agency Thursday announced that King Salman approved the re-opening of Salwa border crossing with Qatar to allow Qatari pilgrims to converge to the holy sites, without electronic permits. The Saudi monarch also instructed that planes of the Saudi Airline be sent to Qatar to carry Qataris wishing to perform the Hajj. Qatar’s National Human Rights Committee (NHRC) also praised the Saudi decision to re-open the border but urged Saudi authorities to be more precise concerning pilgrims residing in Qatar. NHRC, in a statement on Thursday, demanded that all pilgrims get the same treatment and services without discrimination, al Jazeera reports. “The NHRC emphasises that the Hajj cannot be used for political and personal calculations or mediations, rather, it is a right guaranteed by international agreements on Human Rights and Islamic law,” it said. Saudi reports note that Qatari pilgrims began arriving in Saudi Arabia on Thursday following the opening of the border crossing. Saudi Arabia, Bahrain, United Arab Emirates (UAE) and Egypt severed ties with Qatar last June 5 over its alleged support for terrorism – accusations Doha vigorously denied. They also busted air, sea and ground links with Qatar. Posted by KanelkaTagba on Aug 18 2017. Filed under Gulf News, Headlines. You can follow any responses to this entry through the RSS 2.0. Both comments and pings are currently closed.